After doing most of the shaping of the first leg with my cheap rasps and regular spokeshaves, I decided to upgrade. 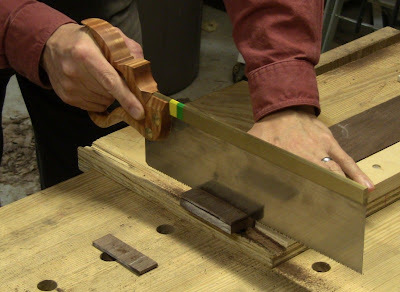 I ordered two 10" Gramercy Tools hand-cut cabinetmaker's rasps, 16TPI and 25TPI from Tools for Working Wood (see detailed review here), and a Woodjoy circular spokeshave from The Best Things. Both rasps worked superbly, but the coarser 16TPI rasp proved to be the workhorse. I was faster with this rasp than with my cheap rasps because I could be more aggressive with it and apply heavier pressure; I didn't have to worry about it chewing the surface to bits. Using my new Gramercy Tools rasp to refine the shape of the foot. 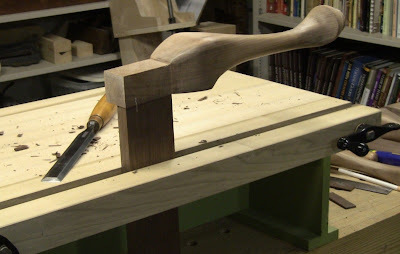 Note the carving vise secured upright on the bench, so I can apply heavy pressure for fast, aggressive shaping. 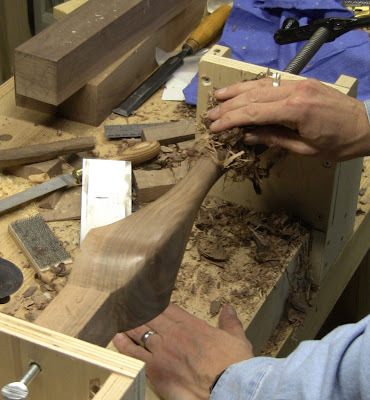 An old turner's trick: burnishing the leg with plane shavings. Look at that shine! The circular shave (aka cigar shave) is based on the Miller's Falls #1 shave. The blade mount allows very precise adjustments. 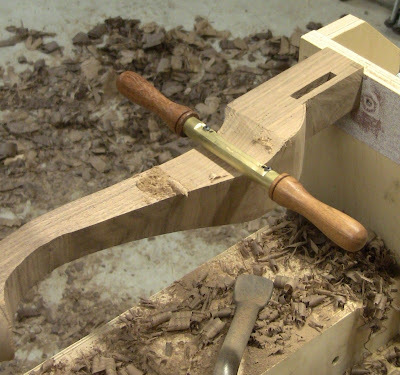 It's virtually non-existent base allows it to fit into much tighter curves than any other style of spokeshave. That does sacrifice a little usability; I still find it a bit fidgety to work with, but for it's specialized purpose no others can match it. 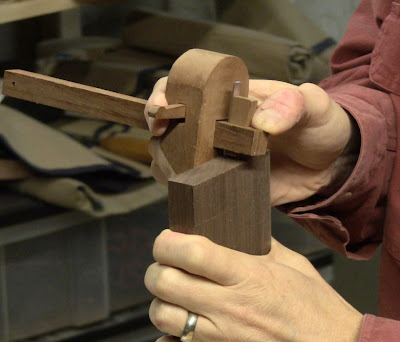 The Woodjoy circular spokeshave on the second leg. 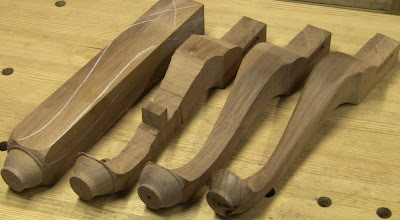 Four legs in different stages of completion: squared-up blank with turned foot; roughly sawn with support bridge still attached; spokeshaved smooth; and completed after rasping, scraping, sanding, and burnishing. For the last leg, I removed the section of bandsaw blade from my bowsaw and switched back to the Gramercy Tools 10TPI bowsaw blade. While this was a little slower cutting, I did have better control with it, allowing me to get closer to the line. That meant faster work at the next shaping step. However, the tight concave curves behind the knees and on top of the feet proved to be time-consuming to cleanup no matter what tools I used. Meanwhile, the convex curves shaved down quickly. All four legs completed. I'll pare the post blocks flush to the rails once they're glued up. Freddy Roman, SAPFM NE Coordinator and period furniture maker and restorer (whose gorgeous work you can see here), asked me if I had kept a log of my time so I knew how long the legs had taken. I hadn't, but I do remember roughly how long each operation took. The table below lists approximate times per leg, as well as some times if you want to speed things up a bit with power tools. A bandsaw would be the most versatile power tool here, given the curves and stopped straight cuts. They include layout and marking. 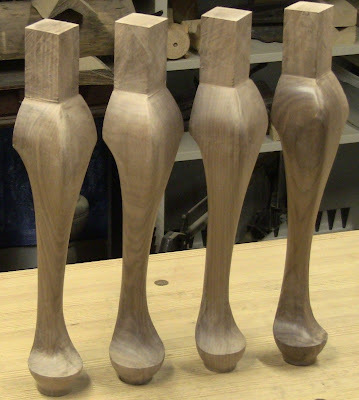 These were my first ever cabriole legs by any method, so I spent some time experimenting with different tools to figure out which worked best. I improved from the first to the last. I had to stop several times to sharpen a saw, plane, chisel, or spokeshave. Each leg has four faces, so even an operation that just takes 5 minutes on a side adds up to 20 minutes per leg. The closer the rough cuts, the faster the clean up in the next step, but don't cut it too close! Leave some margin for error. This is also time-consuming in another way. All the repetitive heavy cutting and shaping did tire me out, leaving sore back and joints. I found that 90 minutes was about my limit, then I needed to take at least 30 minutes break. Sometimes that meant I was done for the evening. There's a reason to have apprentices for the roughing out, whether human or electric! 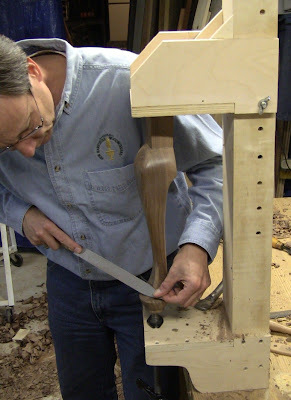 One of the lessons I learned from Matt Wajda's chairmaking demonstration was to pay attention to the grain orientation on the legs. He prefers the front view to present quartersawn grain, since he finds the cathedrals in flatsawn grain to be distracting. 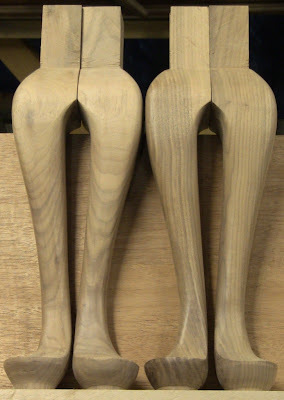 One pair of legs showing a flatsawn face, and the other showing a quartersawn face. I chose to orient my quartersawn faces on the long rails of the stool, matching the front view that a chair would present. The next step was to tenon all the rails. After the curved parts, straight work is fast! 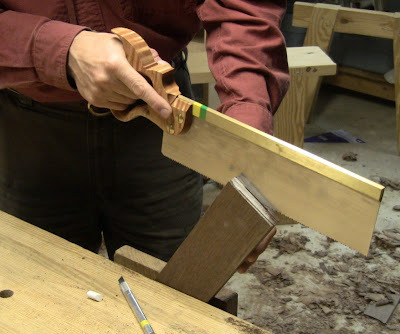 I used a new method for trimming the tenons precisely, from Phil Lowe's article in the October, 2011 issue of Fine Woodworking. 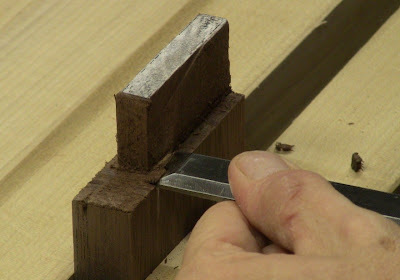 For this method, you don't saw right on the mark, you saw just to the waste side of it, then pare to the line with a sharp chisel. This allows you to relax during the sawing; it doesn't have to be precise. Marking tenon length off the end. Because I had carefully squared up the stock, this was a reliable reference surface. Had I left the end rougher to save time (since it will be buried in the mortise), I would have done this marking with a square off the jointed edge. You might still prefer to mark that way anyway, just to be sure. Marking tenon width. Here's where it's really nice to have the squared-up end. 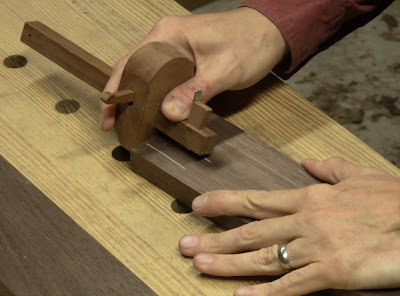 Sawing out the tenon cheeks, staying a bit away from the line. Sawing out the shoulders, again staying away from the line. Now for the shoulder paring, with the piece held in my bench-on-bench. I set the corner of the chisel in the scribe line (a deep line helps here, otherwise the corner may not hold its position well), register the other corner on the part I've already pared, and push in. When the corner gets a bit dull, use the other corner and work from the other direction. These are tiny parings, but it goes fast, and gives a very precise shoulder when done carefully. Similarly for the cheek paring, I set the chisel in the scribe line and shave off the excess, referencing the chisel back against the surface. This is fast, yet allows very fine shavings like a pencil sharpener to tune it up just right. 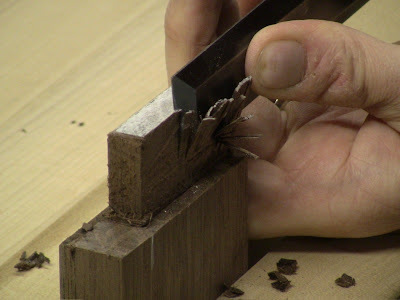 This requires repeated test-fitting and paring for each individual joint, as well as fine shaving of the tenon length to flush up the rails with the top of the post blocks. Note the poor color match between leg and rail. I'll have to stain the legs a bit. After all that time making the legs, I completed sawing and fitting all the tenons in a little over two hours. Then came the moment of truth, dry assembly. Not bad! I used bar clamps to draw everything up tight, then removed them. I love all the little tenon scraps. Also note the white marking pencil to mark each matching piece individually. You don't want to lose track of how the puzzle goes together. I wish I could say all the joints were tight enough that the whole thing could be moved around and stay together, but a couple were a bit too loose. Not enough to present a problem when gluing up. The diagonals measured to within 1/16" of each other, and the feet rested flat on the bench to within the thickness of a sheet of paper; I'll plane them dead flat after glue up with another little chairmaker's trick. Considering all the ways this could have gone wrong and the time invested, I was ecstatic with this result! The next step will be molding the rails and sawing the decorative curves in them, then glue-up. Skills I can only dream of aspiring to. Well impressed! From following your blog for a while I would say you have entered into the next league of working wood. 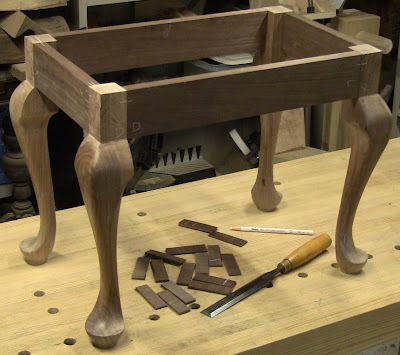 Impressive progress in such a short time, esp for a first set of cabriole legs. I think that will be a "New Year's ww'ing resolution" for me. I have too many other projects in the pipeline to start on them in the next few months.